Is the belly button popping out a sign of pregnancy? Goa is a great place to visit. A trip to Goa can actually change the way you look at life. Goa is well-known all over the world. Goa is known for its tourism and attracts lots of foreigners every year. From enjoys a peaceful yoga session on the beach to exploring caves and paragliding, Goa is full of surprises. You can go to Goa just to experience new adventures and eat new types of delicacies. It would be a great adventure to make new friends from all around the world and go on adventures together. Here are a few adventurous things you most definitely have to try during your visit to Goa. 1. Trek through the lush forest to reach Dudhsagar falls. This waterfall in Goa is simply just majestic. The falls during the monsoon has enormous force. It is a wonderful experience to watch this majestic waterfall. For the nature lovers and adventure seekers, the trek to Dudhsagar would sound very exciting. The path would be covered with lush green trees and shrubs. For the less adventurous ones, you can choose to take the train to Dudhsagar. The train stops in front of the falls. You can experience the majestic force of this water falls from the train itself. Nothing feels more like flying than paragliding does. Paragliding is a great way to feed your spirit some excitement. 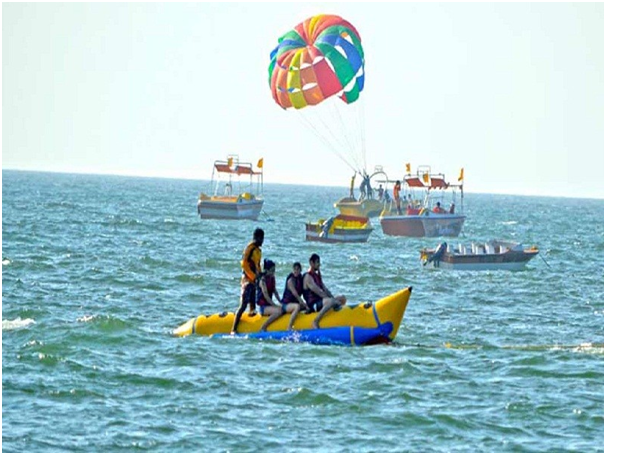 The ideal spot to go paragliding would have to be Goa, as you get the astonishing view of the deep blue sea on one side and the lively shore on the other. Experiences like these make you realize how very small we are on this beautiful planet and how very small our problems are. What could be a better way to experience the marine life than snorkelling? The guides will teach you how to communicate and breathe underwater. You will also be provided with masks and safety jacket. Each participant will also be guided by an instructor on a one to one basis. You can see various vibrant fishes, sea cucumbers and corals, etc. The whole experience is also filmed, and you can take your memories back with you. Sometimes you even get a lucky chance of seeing a turtle in the ocean. Get expert guidance and training for the surfing. Goa proudly hosts several surfing Schools that provide international standards of equipment as well as training. There are simple classes to learn surfing as well as intensive courses to get an instructors certificate. Surfing to the tune of the waves is a great way hobby that keeps you excited as well as fit. Kayaking is more of a milder kind of sport. Kayaking in Goa would be a peaceful experience. You can choose to go for a single kayak or a double kayak. Depending on your comforts, you can choose to paddle alone or as a team. The coordination is easier when you choose a single kayak. This also helps you find some alone time for yourself as well. These are a few amazing ways to enjoy your Goa trip. Goa can be an enriching experience for you and your friends. So, what are you waiting for? Pack your holiday essentials, documents, and your camera and don’t forget your sunblock.